Hamas Conflict Could Have Lingering Impact On Israel's Economy : Parallels With a shaky cease-fire holding, Israel is starting to take stock of how much the monthlong war with Hamas will cost. 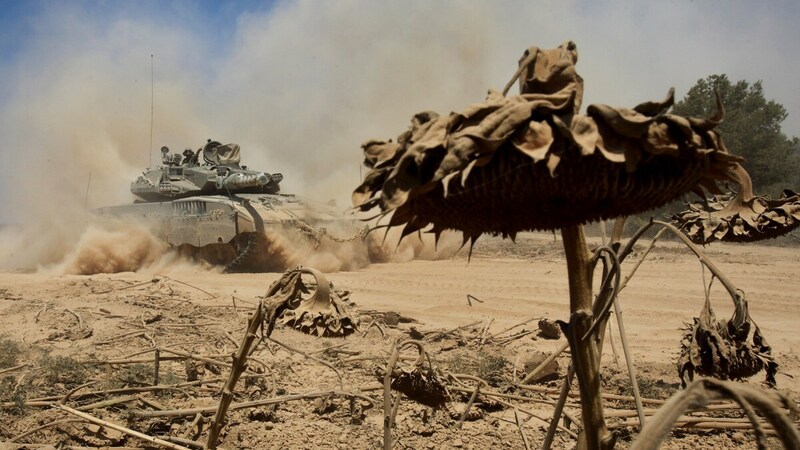 An Israeli Merkava tank drives past a field of sunflowers along the border between Israel and the Gaza Strip as it moves out of the Gaza Strip on Aug. 3. Itay Maoz climbs into his dusty SUV and presses a series of buttons on his cellphone, which opens an electronic gate surrounding the Nahal Oz Kibbutz. From here, in the far south of Israel, you can see across the border into Gaza and the remains of buildings pulverized by Israeli missiles. This 2,500-acre collective farm was on the front line during the war between Israel and Hamas, and it sustained millions of dollars worth of damage. Maoz points at a patch of hard earth, gouged with deep tracks, leading toward Gaza. 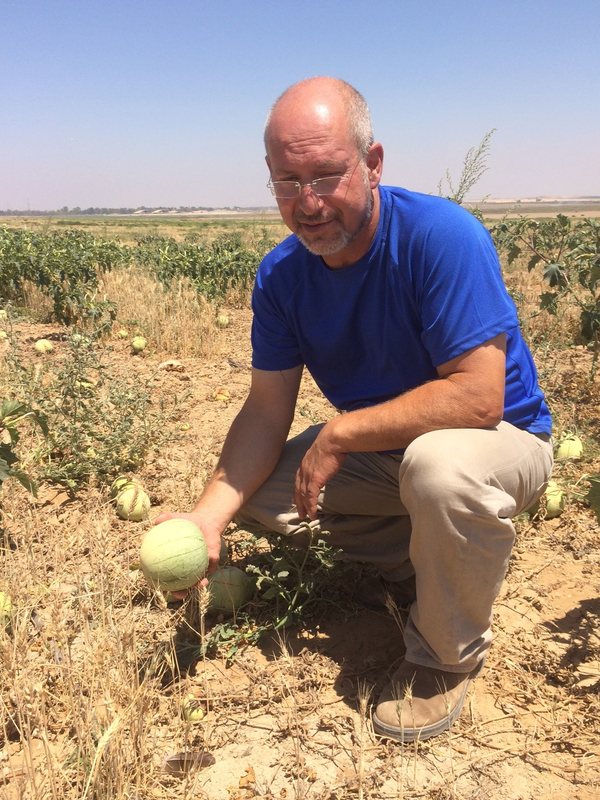 Itay Maoz, who lives on a kibbutz in southern Israel near the Gaza Strip, shows off small and rotting watermelons from a field that was abandoned during the fighting between Israel and Hamas. "That used to be a road," Maoz says. "Not anymore." He says all the military tanks were crossing here, so there's nothing left of the road. Maoz says Israeli tanks and soldiers swarmed this area once the fighting with Hamas began. The tanks flattened the fields, destroying everything in their path, including the kibbutz's sophisticated irrigation system, turning the area into a large dust bowl. Residents were ordered not to go into the fields, and Maoz says hundreds of acres of cabbages, wheat, melons and more were destroyed. He says the fruit in a nearby watermelon field should be green and blooming right now, but after six weeks without water, the watermelons are very small and rotting. "That's a total loss of the field — nothing we can do with this field," Maoz says. He says the crop next year, and probably the year after, will also be affected. Maoz estimates the cost to be 6 to 7 million shekels, about $2 million U.S., and has appealed for government help. He says the kibbutz was adequately compensated after other wars with Hamas, but this one went on much longer. Analysts say the war could cost the Israeli economy about $3 billion, if you include things like lost wages. Businesses, especially those in the south, suffered as customers stayed in their homes. In the nearby city of Ashkelon, often a target of rocket fire from Gaza, the shopping malls were empty throughout much of the conflict. At an Office Depot shop, deputy manager Elena Smolanov says the parking lot was empty day after day. "People didn't leave their home, they were scared," she says. "We were sitting here, basically five employees each shift, and just basically looking at each other." Smolanov says customers are starting to trickle back, especially with the start of a new school year. 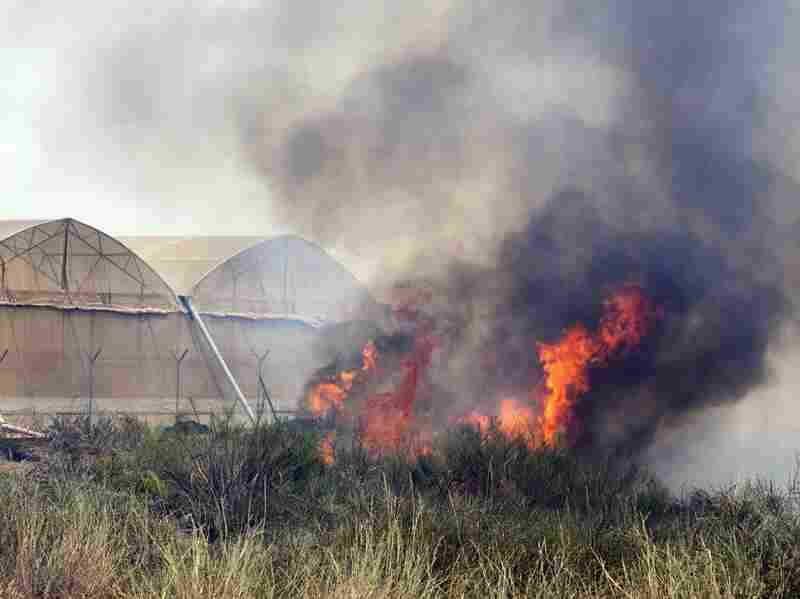 Fire consumes a field close to greenhouses on a farm in the Israeli Mediterranean coastal city of Ashkelon after a rocket fired by Palestinian militants from the Gaza Strip landed there. One of the hardest-hit sectors was tourism. The number of foreign tourists arriving plummeted more than 25 percent. The Israeli government was outraged when the U.S. Federal Aviation Administration suspended American flights to Israel after a rocket landed near Tel Aviv's Ben Gurion airport. Some Asian and European airlines continue to stay away. A new radio and TV campaign is trying to reverse the decline in tourism locally and from overseas. While Israeli spokesmen highlighted the rocket threat during the war, tourism minister Uzi Landau is now stressing a different view. "In fact, the true story in the country is different," Landau says. "When you come to the place, you do see in all of our cities, apart of those areas which are close to Gaza, lines go on almost as if it were routine." Yacov Sheinin, director of the consultancy firm Economic Models, says Israel's economy, which has been averaging more than 3 percent growth per year, will rebound from this, as it has after other conflicts. He says robust sectors, like high tech, will continue to attract foreign investors. "If they're coming to high tech, they will come, they're coming," Sheinin says. "[But] not as much as we could get if there would be peace." Sheinin says foreign investors will come because they know about the cost and the risk. The one area that will see perhaps the largest growth is defense. Israel's defense ministry is asking for a more than $3 billion hike for next year, something Israel's finance ministry calls "excessive."